Seventeen distinguished historians and political scientists discuss the phenomenon of Indian Nationalism, one hundred years after the founding of the Congress party. They offer important new interpretations of Nationalism's evolution during more than six decades of crucial change and rapid growth. As India's foremost political institution, the National Congress with its changing fortunes mirrored Indian aspirations, ideals, dreams, and failures during the country's struggle for nationhood. 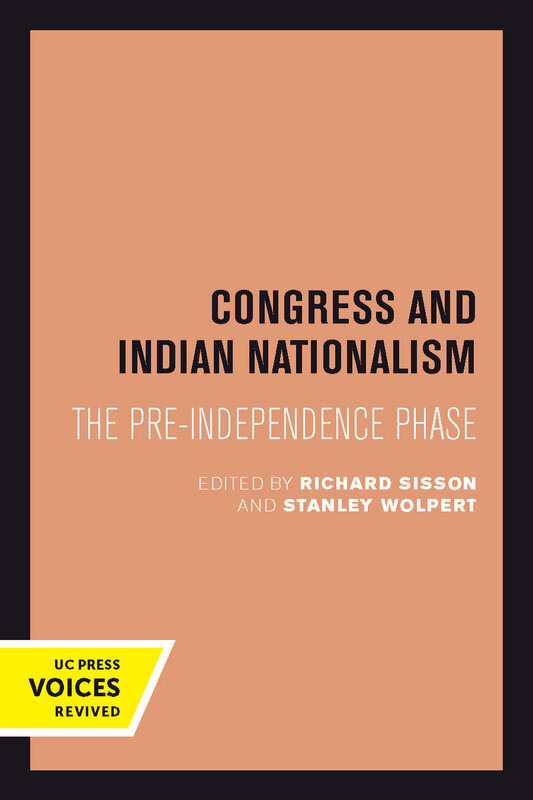 Many difficulties face by the pre-independence Indian National Congress are critically examined for the first time in this volume. Major times of crisis and transition are considered, as well as the tension between mass action and political control and the problem of creating and maintaining unity in the face of divisive social and economic interests and between deeply hostile religious communities. A composite portrait of the Congress Party emerges. We see a coalition of often conflicting communities and interests much like India itself, struggling to stay together, tenuously united by little more at times than a common "enemy," the imperial British Raj. But linked together in precarious, seemingly haphazard fashion, shifting networks of elite political entrepreneurs manage to keep India's National Congress alive long enough to convince the British that it would be easier to "Quit India" than to try to hang on to it by force. With the abrupt transfer of power form the British to the independent Dominions of India and Pakistan in 1947, Congress provided institutional sinews for the administration of what had been British India and over five hundred Princely States. By contributing to a deeper understanding of India's nationalist experience, this volume may illuminate the experience of other Third World states. Essays by:S. BhattacharyaJudith M. BrownMushirul HansanZoya HasanD.A. LowClaude MarkovitsJohn R. McLaneW.H. Morris-JonesGyanendra PandeyBimal PrasadRajat Kanta RayBarbara N. RamusackPeter D. ReevesHitesranjan SanyalRichard SissonStanley WolpertEleanor Zelliot This title is part of UC Press's Voices Revived program, which commemorates University of California Press’s mission to seek out and cultivate the brightest minds and give them voice, reach, and impact. Drawing on a backlist dating to 1893, Voices Revived makes high-quality, peer-reviewed scholarship accessible once again using print-on-demand technology. This title was originally published in 1988. Richard Sission is Professor Emeritus of Political Science at the University of California, Los Angeles. Stanley Wolpert is Professor Emeritus of History at the University of California, Los Angeles.